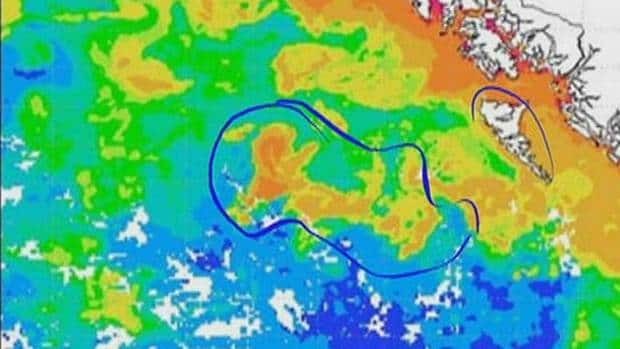 It was revealed this week that Russ George, a controversial American Businessman (Deep-Sea News ran a good piece this week covering his chequered history), dumped around 100 tonnes of “iron-rich dirt-like material” off the west coast of Canada in July in order to “gather data targeting all the possible fears that have been raised” about ocean fertilization – an act that is in violation of two international moratoria designed to prevent material from being dumped in the ocean. Judging from the poor quality of news coverage on the issue, which tended to include the deceptive image shown above (Image 1), there are a lot of misconceptions about iron fertilisation of the ocean. Here is the official Words in mOcean idiot’s guide to make you instantly more knowledgeable on this subject. 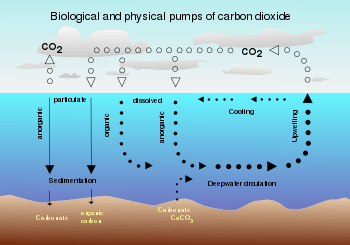 Phytoplankton in the ocean take up CO2 via photosynthesis and, when they die, a small proportion of the fixed carbon sinks out of the surface ocean, into the deep ocean (via the biological pump; image 2), to be locked up over long time periods. The idea behind ‘ocean fertilisation’ is to introduce nutrients into nutrient-deprived areas of the ocean in order to increase algal growth – increasing the amount of CO2 removed from the atmosphere in the process. This tactic is most effective if you introduce trace elements into the ocean rather than macronutrients (nitrate and phosphate), as less of the desired nutrient has to be used in order to achieve the same effect. But are there any areas in the ocean where growth of phytoplankton is limited by a single trace element I hear you ask. Well yes, and that’s where iron comes in. Primary production in large areas of the ocean is limited by low iron concentrations: we call these high nutrients low chlorophyll (HNLC) regions (Image 3), as there are high concentrations of other nutrients needed by phytoplankton, but iron is missing (generally due to low atmospheric dust inputs), so chlorophyll concentrations (an indicator of phytoplankton biomass) tend to be relatively low. Large scale experiments suggest that iron addition can stimulate algal growth — detecting this growth against a background of natural variation is difficult though (and best left to the experts), so beware anybody that claims a bloom was caused by iron deposition. What is actually more important is not how much algal growth is stimulated, but rather how much of this excess algae sinks out of the upper ocean, via the ‘biological carbon pump’, to be locked away out of the atmosphere. Generally, this number is thought to be quite low*, but also highly variable between studies (from undetectable increases in the amount of sinking material, up to 50% increases). Modelling studies suggest that iron fertilisation could only make a partial contribution to climate change mitigation: to take up 30% of annual CO2 emissions would take, by one study’s estimate, a region of 10,000,000,000 km­­­2 – an area much larger (an order of magnitude) than the entire Southern Ocean! There are also other things to consider: what would be the mining impact of obtaining the iron for fertilisation? Would iron fertilisation continue to work in the long term (or would other nutrients eventually become limiting as they were used up)? There is even a recent suggestion that low phytoplankton biomass in the southern ocean (the biggest HNLC region) may ultimately be due to grazing pressure — in which case, iron fertilisation may not be that effective here. Could there be adverse effects? Selection for non-favourable blooms of algae (e.g. harmful algal blooms; Image 4). Long-term changes in the ratio of other nutrients in the ocean. Changes to the structure of food-webs, with potentially detrimental effects to organisms at higher trophic levels (potentially impacting fisheries). Changes in oxygen distributions, and an increase in the size and number of oxygen minimum zones. Changes to the cycling of non-CO2 greenhouse gases (e.g.methane, nitrous oxide and dimethyl sulphide), which could outweigh the benefits gained from sequestering CO2. A group of leading scientists, in a short policy forum article in Science from 2008, recommended that future experiments be regulated “in a uniform manner under such international agreements as the London Convention, widely distributing science plans and results via open meetings and peer-reviewed journals, and requiring clear and explicit statements of conflicts of interest”. The same paper also concluded that there is currently “no scientific basis for issuing carbon credits for ocean iron fertilisation”. Russ George appears to be going directly against these suggestions: he’s trying to collect his own data, in a closed, secretive way in order to push through ocean iron fertilisation so that he can profit from a carbon credit scheme. Commercial interests can’t be allowed to manipulate the science in order to turn a quick profit. Before this geoengineering strategy is seriously considered, experiments need to demonstrate that a significant amount of carbon is locked away in the ocean for long time-periods, and that the environmental impacts are predictable and acceptable. *the ‘biological carbon pump’ is pretty inefficient. Many algae are grazed by zooplankton predators, infected by marine viruses (subsequently bursting open), or decomposed by protozoans, bacteria and fungi. Buesseler, K.O; Boyd, P.W. (2003). Will Ocean Fertilization Work? Science, 300: 67. Buesseler, K.O; Doney, S.C; Karl, D.M. et al. (2008). Ocean Iron Fertilization–Moving Forward in a Sea of Uncertainty. Science, 319: 162. Pollard, R.T; Salter, I; Sanders, R. J. et al. (2009). Southern Ocean deep-water carbon export enhanced by natural iron fertilisation. Nature, 457: 577-580. Smetacek, V; Klaas, C; Strass, V.H. et al. (2012). Deep carbon export from a Southern Ocean iron-fertilized diatom bloom. Nature: 487, 313-319. And no mention of satellite algorithm performance or in situ chl validation 😉 Tsk tsk. Great post David! Thanks Hayley. I would love to see ‘in situ chl validation’ written in a newspaper!